These days it seems the workplace has become a carnival of doing. Everyone—from senior leaders to customer-facing operational employees—is in a constant state of action. There is less and less time for reflection, pausing, ideation, or even good decision-making. Furthermore, this “always on” mindset is affecting the manner in which we are leading people and initiatives. The learning profession is no different. We scamper from meeting to meeting. We are late. We leave early. We check email, answer texts, and surf the web while we’re supposed to be watching our kid’s soccer game. We pretend we’re paying attention to the conference call but instead are crafting an instructional design document for our next meeting (which is in an hour). When we teach, our phone longs for our attention. “Who was it that just texted me?” you mutely ask yourself in the middle of an exercise. The classroom full of learners is easily distracted, too. We’ve resorted to leaving baskets at the back of the room so attendees can place their phone in them for the duration of the class. Leaders are no better: When in the middle of a coaching conversation with their team member, they suddenly remember they’re supposed to be somewhere else—and leave! A lunch meeting between the boss and employee is cut short because they are called into something else. What was originally a 60-minute lunch is crammed into 30. “I guess it’s better than nothing,” thinks the now-jaded employee. Not only is this affecting the way in which we lead—and how colleagues and employees perceive one another—the inability to manage our time is affecting levels of stress. According to the American Institute of Stress, 80 percent of workers feel some form of stress on the job. 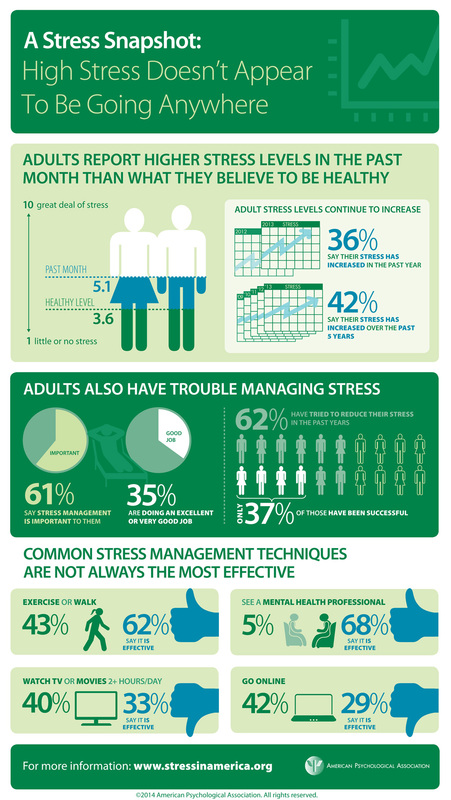 Nearly half say they need help learning how to manage stress. A whopping 30 percent indicate they are “always” or “often” under stress at work. The American Psychological Association reports levels of stress continue to rise. Analysis by Accountemps reveals 60 percent of employees feel work-related pressures have increased in the last five years. The University of Lancaster discovered that we are now spending five hours a day on our mobile phones. Why? In an “always on” corporate culture to accommodate a “do more with less” culture, we believe we have to work at all times of the day, often on mobile phones answering emails, texts, and other encroachments on our time. DMR, for example, reports that the average office worker now receives 121 emails per day. Another study by Asurion indicated that Americans check their phone on average once every 12 minutes, or more than 80 times a day. Further compounding the busyness crisis is how it affects our levels of creativity. Any learning professional knows the importance of being creative, but when we are overly busy it cramps our ability to dream and let our mind wander. Good thinking needs creativity. If we are excessively busy, there is no opportunity to daydream. Consequently, the ideas dry up or they do not surface at all. That’s not great news for anyone in the learning space. The busyness crisis forces our brains into a different way of behaving. Most notably, we believe multitasking is the way to dig out of the being-overly-busy hole. The short answer is that it doesn’t work. A 2015 study with judges from Milan covering nearly 60,000 cases, for example, found that those who took on more than one case at a time ended up taking longer than if they focused on just one. I have seen the enemy. Much of that stress, busyness, and the downward spiral of engagement is as a result of our failure to manage our calendars and the inability to block out distractions. In essence, we have lost the aptitude to manage our time. The first step is to take back control of your time. Stop filling up your calendar with mindless meetings. Block out “me time,” when you’ll be able to devote focused attention to your tasks and projects. Second is to stop saying yes. Far too many people say yes to encroachments on their time, when they should be saying no. Third, focus on what matters. If you are in a meeting, stay within it and be present. If you are having a conversation with a team member, stay aligned to the conversation and not the vibrating feeling of a new text. If you are working on a new piece of learning, remain in the moment and ensure you do not get distracted by whatever trinket looks more interesting. Time has become the enemy of productivity. Your job is to reclaim it. The ATD Forum is a consortium for senior training and learning practitioners and their organizations to connect and collaborate in a confidential environment. Member organizations share evidence-based and proven ideas to rapidly improve organizational capability in an experiential environment. Dan Pontefract is the founder and CEO of The Pontefract Group, a firm that improves the state of leadership and organizational culture. He is the bestselling author of three books: Open to Think, The Purpose Effect, and Flat Army. A renowned speaker, Dan has presented at four different TED events and also writes for Forbes, Harvard Business Review, and The Huffington Post. Dan is an adjunct professor at the University of Victoria, Gustavson School of Business and has garnered more than 20 industry awards over his career. Previously as Chief Envisioner and Chief Learning Officer at TELUS—a Canadian telecommunications company with revenues of $14 billion and 50,000 global employees—he launched the Transformation Office, the TELUS MBA, and the TELUS Leadership Philosophy, all award-winning initiatives that dramatically helped to increase the company’s employee engagement to record levels of nearly 90 percent. Prior to TELUS he held senior roles at SAP, Business Objects, and BCIT. Dan and his wife, Denise, have three children (aka goats) and live in Victoria, Canada.